Keys to Google Rankings Might Not Be What You Think - Fair Marketing, Inc.
Everyone who owns a website wants that domain to reach as high in the search engines as possible. The Google search engine is typically thought of as the gold standard when it comes to rankings. Figuring out how to rank higher in Google might seem easy, but in truth there is more to it than what meets the eye. How does Google determine search engine rankings? Google has a complex algorithm that uses a lot of different factors to determine search engine rankings. In the past, it was a website chocked full of keywords: long tail keywords, short tail keywords, and nonsensical keywords were all you needed to get to the top. Before too long, Google realized that the websites that were ranking at the top weren’t providing people with the information they needed. This is where the Google algorithm came into the picture. Google began looking at the content on pages. Was it useful? Were the sources — or outbound links — reputable? Did the page make sense? Did it contain what readers wanted to find? All of those questions play a part in how Google ranks websites. The exact algorithm isn’t known. Google updates it periodically and has never released the full algorithm. Instead, it only releases tidbits that are more like a tease. What is truly important in the Google algorithm? There are several factors that are important to Google. We recently discussed how Penguin 4.0 can affect rankings, and how duplicate content can impact rankings. There is another key component that matters for rankings — interaction. Google uses RankBrain to determine user engagement with your website. This is crucial to your domain’s rankings, but it isn’t something that can truly be optimized. The reason why RankBrain optimization isn’t possible is because there are many facets of engagement that the program considers. 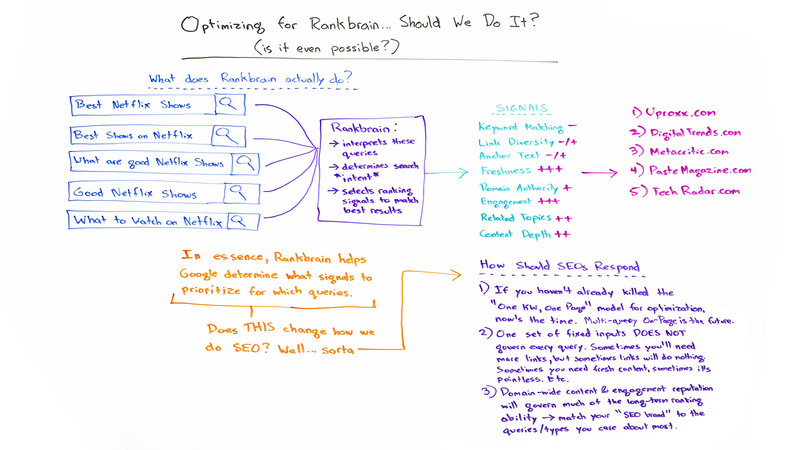 Some say that being able to optimize for RankBrain is akin to finding a unicorn. So, why bring it up if we can’t do anything about it? Well, you can do something about it, at least in part. RankBrain starts by interpreting the query or search that a person entered to get to the website. The program doesn’t stop there — it also works to determine the purpose of the search. It then evaluates the page that pulls up for the search and determines if it has what people are looking for. RankBrain also determines the level of engagement that people have with the website, as well as the depth of information that is passed along to the reader. It determines the percent of link click throughs a page has and compares that to similar pages. When it comes to the content on the webpage, you have to make sure that the information is up-to-date. RankBrain also considers the freshness of the content as a component of the ranking. Once RankBrain has completed the evaluation of a domain, it sends information to Google about what “signals” or facets of the search information matter for a term. It then lets Google know how that website ranks for each of the applicable signals. What does all of this mean for my website? The SEO strategies people have relied on for many years aren’t any good now that RankBrain is a component of Google’s search engine ranking algorithm. As technology advances, facets of website evaluation that once required human evaluation can now be evaluated by a program. In the past, domain owners could have many pages on their domain. Each of those pages would focus on a single keyword. That won’t work now. Instead, having rich content that covers multiple keywords on a page, as long as those keywords are all intertwined in a logical manner, is what is important. When concepts are explained and expanded upon on a single page, RankBrain will notice that readers are staying on the page longer. When concepts are linked using outbound links, RankBrain will find the click throughs. That doesn’t mean that you need to have so much information that it overwhelms readers. Instead, you need to make sure that you have enough information to keep people on the page, but not so much that they get bored.